To give you an idea of just how old the first-generation Audi Q3 is, imagine that its design was based on the Cross Coupe quattro concept, which was first drawn up back in 2006. This all-new second generation model was long overdue. Right off the bat, it’s obvious that Audi wanted to leave the old Q3’s styling in the dust, by making this new crossover look more aggressive from just about every angle, giving the BMW X1 a worthy opponent to play with. 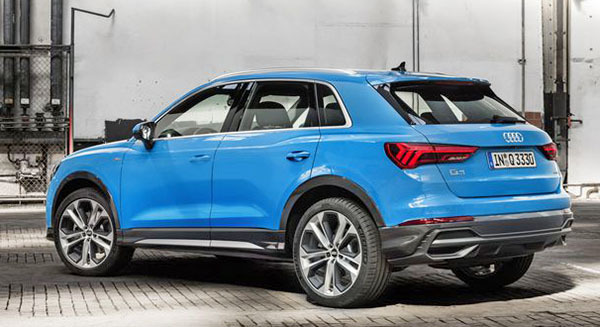 This new Q3 actually shares some of the Q8’s design elements, especially when it comes to its profile. It also has vertical grille bars like the Q8, or the A4/A6 Allroad duo. All other Audi models feature horizontal bars. Other distinguishing features include a sportier front bumper, large taillights, and headlights that resemble those of the A3 Sportback in shape, only a little more pointy. 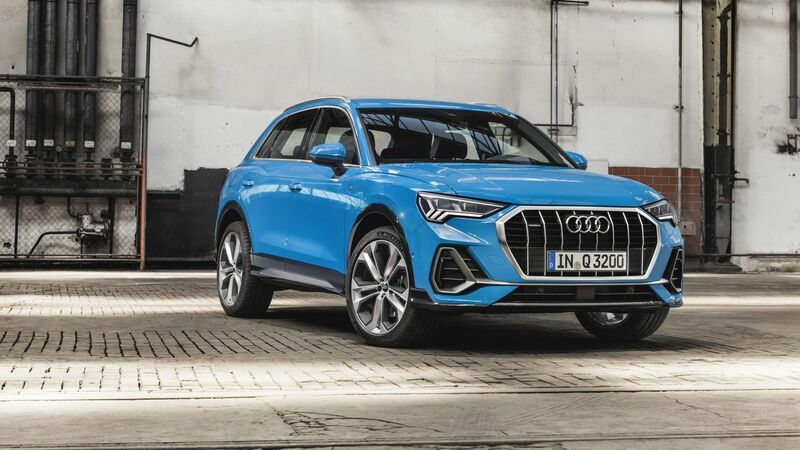 Audi has also expanded the overall size of the Q3, making it approximately 3.8 inches (9.65 cm) longer than the older model, while adding three more inches (7.6 cm) to the wheelbase too. This means more room for rear seat passengers, while still leaving 23.8 cu.ft (674 liters) of cargo space in the trunk – which you can then turn into 53.9 cu.ft (1,526 liters) if you fold the seats. By comparison, the 2018 BMW X1 has 17.8 cu.ft (505 liters) of available trunk space, and a full 54.73 cu.ft (1,550 liters) with everything folded down. Inside, 2019 Q3 buyers will enjoy Audi’s 12.3-inch Virtual Cockpit gauge cluster, plus an 8.8-inch center dash infotainment display – with a larger 10-inch one available as an option, where the software will be the same as on the all-new Q8. Features such as Apple CarPlay and Android Auto are both standard, as are the two USB ports in the front. There are also two additional USB ports and a 12-volt outlet for rear seat passengers, plus available Wi-Fi hotspot. One cool piece of tech is the Connect portfolio with “swarm intelligence”, a feature that helps cars communicate with among themselves regarding road and weather hazards. The system will be available in Europe and possibly in the U.S. too, although not at launch. 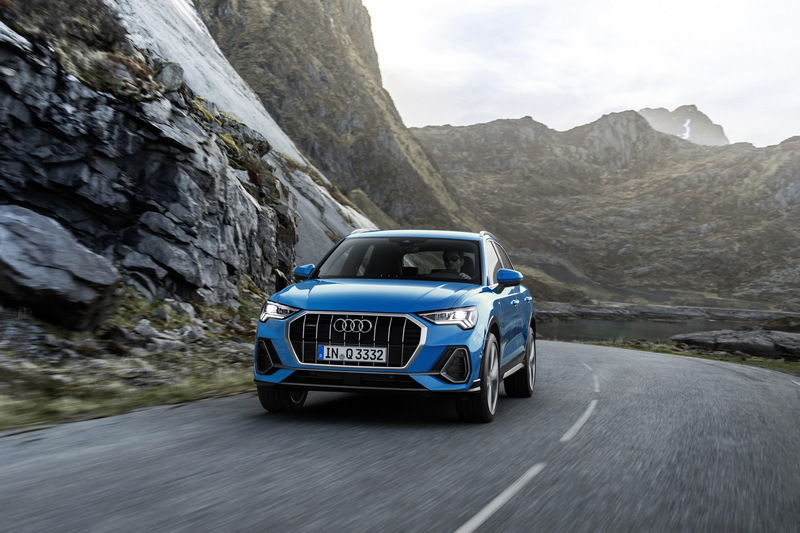 As for safety, the all-new 2019 Audi Q3 comes with forward emergency braking, lane departure warning, rear cross-traffic alert, plus adaptive cruise control with traffic jam assist and active lane assist. We can expect 2019 Q3 customers to choose between multiple petrol and diesel options, although at launch, only three engines will be available globally. Among them, the automaker’s 2.0 TFSI 190 PS unit – working in conjunction with a 7-speed automatic, as well as quattro all-wheel drive. The new model also gets automatic damping control and a “dynamic handling system” with the following six drive modes: Auto, Comfort, Dynamic, Offroad, Efficiency and Individual. European customers will land their 2019 Q3 crossovers this November, while U.S. sales should commence at a later date. Last edited by vb22; 07-24-2018 at 02:07 PM. That interior certainly looks much more luxurious. Interesting that Audi is extending the A7/A8 interior design down the range, not differentiating the lower-spec cars like they have in past (a la A3/S3). Is this the last PQ35 holdover model to be replaced? The old Q3 was well overdue. Will be interesting to see how fuel economy and interior volume compare with the Golf. Agreed. I believe this is the last of the PQ35 models. It's also a very good picture of what the next gen A3 is going to look like, especially for the interior. So much better than the outgoing model, that thing was a trainwreck in the looks department. Wow. This redesign is miles and leap of faith better than current Q3. Any more photos? Big upgrade inside and out, but I think this era of Audi interior design will age terribly with the big silver bezels and overly sharp lines. Yeah, it's nice to see they are integrating the screens on all cars and not tacking on screens to match industry trends. Yeah, it needs a honeycomb grill and two oval black exhaust tips. I have a hard time believing that sloped hatch design has more cargo space than the X1 and their numbers listed for the X1 are incorrect which should be 27 cu.ft and 59 cu.ft. Q3 is the last Audi PQ35 but not the last VW PQ35. Both Beetle and Caddy are still using PQ35. Re-badged tig like last time? Last edited by vb22; 07-24-2018 at 07:17 PM. The side profile has a baby Bentayga feel to it. Does it only come in that color? Looks awkward from some angles, like they're trying to shoehorn the styling of a much bigger car into a tiny footprint. And the grill makes it look like it has braces. Really well done inside and out.